Russian preacher; born in Slutsk, government of Minsk, June 6, 1856. He received a thorough rabbinical education, spending two years in the yeshibah of Mir. Later he settled as a teacher in Pinsk, where he remained about fourteen years, occasionally preaching. In 1887 he went to Yekaterinoslaf, where also he taught and preached. In 1891 he went to Odessa, where his oratorical talent attracted the attention of the Zionist leader M. L. Lilienblum and others, who advised him to devote himself entirely to preaching. For the following three years he traveled through many parts of Russia, his Zionist speeches arousing much enthusiasm. In 1894 he went to England, and in 1895 to the United States, where he is recognized as a foremost Yiddish and Hebrew orator. Since 1898 he has lectured every Friday evening in the auditorium of the Educational Alliance, New York city. 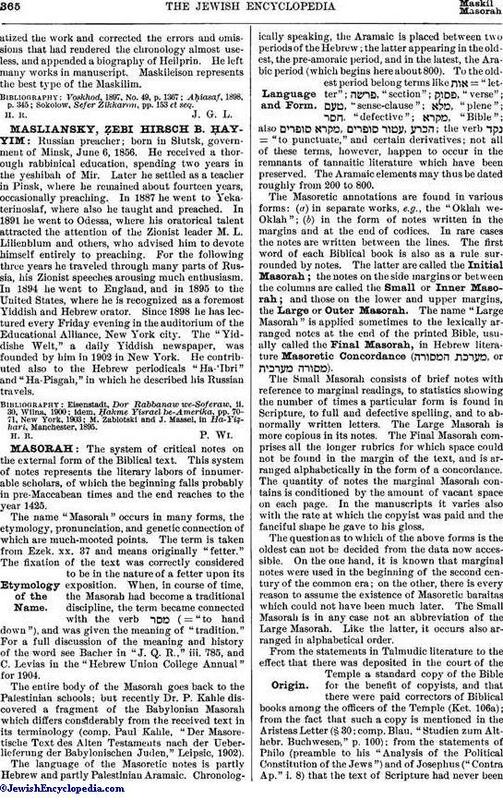 The "Yiddishe Welt," a daily Yiddish newspaper, was founded by him in 1902 in New York. He contributed also to the Hebrew periodicals "Ha-'Ibri" and "Ha-Pisgah," in which he described his Russian travels. M. Zablotski and J. Massel, in Ha-Yiẓhari, Manchester, 1895.